Just a quick note to viewers to let you know posts are a bit behind due to intermittent and sometimes totally absent internet service. We will post whenever we can, and topics / days could be out of time order. Many apologies! We have taken so many photographs between all of us, that it will take quite a while to post everything. Thanks for your patience and understanding. Tomorrow we head to the dry forests and mangrove swamps of Nosara and Ostional on the Pacific coast, leaving the tropical Caribbean coast and cloud forest behind. We are two-thirds of the way through the trip, so are on the last leg of our amazing journey. We stop at Las Pumas Wild Animal Sanctuary tomorrow, where course participants will get the opportunity to see some beautiful animals like pumas, jaguars, and ocelots to name a few. If it were not for this sanctuary, these rehabilitated animals would not have survived. In the coming days students will learn about the amazing adaptability of the plants and trees in the mangrove swamps in Nosara, and hopefully get the opportunity to witness nesting of the Olive Ridley turtles in Ostional, much like we witnessed the nesting process of the Green turtles in Tortuguero. What an amazing trip this has been, and students have seen a variety of ecosystems, and life zones. More posts to follow in the coming days! Pura Vida! In an earlier post , we shared about our trip through the Venado Caves, and promised pictures. Here they are! We hope you enjoy them as much as we enjoyed the experience! Pura Vida! Today is Day 13 of our 18 day trip around this amazing country of Costa Rica. We just hiked out of the cloud forest, having spent several days at the San Gerardo field station, which is run by Giovanni and his wife Ibania. Their son Andre’ has grown a lot since our last visit! What wonderful people, and what an amazing cook Ibania is! We were well taken care of. Students enjoyed the hammocks that were hung the entire length of the upstairs porch, outside the rooms. This set-up provides an incredible view of Lake Arenal and Arenal Volcano. The region is situated near the Continental Divide, so gets frequent rains from the Caribbean side of the Divide. The frequent presence of clouds and rain often obscures the peak of Arenal, which was the case during our stay, but the serenity and beauty of the forest made up for it! We think students will agree that this was one of the most peaceful places during our trip. During our time at the field station, course participants enjoyed some much-needed project time and multiple walks in the forest learning about cloud forest ecology and the biology of this area. This included medicinal plants, epiphytes, mammals like the coati and agouti, a host of insects, and many birds, including a myriad of wrens, tanagers, vultures, and so many others that are either residents or migrants. The birders in the group had the rare opportunity to go on 6am birding walks with our guide, Mark Wainwright. What an unbelievable and unsurpassed experience this was. The bird biodiversity in this region is incredible. On our way out of the field station today we saw a White Hawk Pseudastur albicollis, which for all of us who saw it, was a truly spiritual moment. Hopefully our pictures will capture the beauty of all the animals and plants we photographed. Below are several GPS Google Earth maps showing our journey from Tirimbina to Rancho Margot, so students and their families and friends can see our path around the beautiful country of Costa Rica. Students had the opportunity to milk cows and plant seedlings today at Rancho Margot, a fully sustainable working farm. The majority of the food prepared here comes from the farm, including the beef, poultry, pork, all the dairy (milk, eggs, cheese, yogurt, butter), vegetables and fruits. Students have enjoyed learning today about the way an organic, sustainable farm functions, and participating in the process. Apologies for some blurry pics, which is due to humidity getting into the camera. Humidity is one thing you cannot avoid in a tropical rain forest ecosystem! Yesterday we left Tirimbina to head to Rancho Margot, which is where we are now. Rancho Margot, is a fully sustainable, working farm, that all the students would agree feels like heaven! Coming from a hotter climate zone, this temperate climate zone is a refreshing change from the sticky, lowland rainforest feel. We are still located in the tropical rain forest climate zone, but we are fairly close to Monteverde, which is a cloud forest climate zone. This perfect location between two zones creates a moderate temperature, with frequent rain showers, but absolutely delightful. The cool breezes and sounds of the birds are calming and restorative. Students have already had a chance to relax, and immerse themselves in their research topics and enjoy some group time today. The group is also getting a tour of the farm, will get a chance to milk cows and work on the farm later today, and get some time to work on projects, do yoga, or soak in the warm compost-heated pool. Pictures will follow later! On the way here yesterday we made a couple of awesome stops. Our first stop was the Iguana Bridge, where we saw a large assortment of iguanas basking in the trees, and we also enjoyed some delicious ice cream! Our next, and totally amazing stop was at the Venado Caves. These originated 17 million years ago, pushed up from the sea by tectonic plate movement, at a location where the Caribbean plate pushes up or subducts the Cocos plate. The caves were spectacular!!! Huge limestone stalactite and stalagmite formations, beautifully sculpted by water erosion, surrounded us. Four species of bats make their homes in these caves, and students looked thru Mark’s telescope at nectar and vampire bats. The group climbed through a narrow passage called ‘el nacimiento’, or the birth canal, got to wriggle under ledges, up a rock staircase, and under a spectacular waterfall to see the ‘Papaya’ – a formation shaped by stalactites and stalagmites joined together from ceiling to floor. It was an experience that students will always remember. We purchased a CD of pictures that were taken by a professional photographer inside the caves. We will post those later after we get access to an external CD player to upload the pics from the CD. 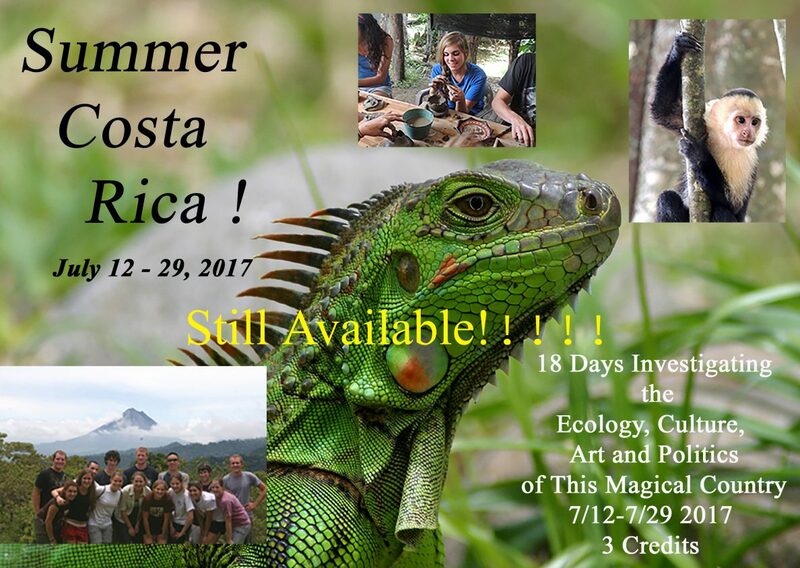 Additional pictures include views of Arenal volcano from the bus, Ginger the dog at Rancho Margot, students enjoying the delicious food at Rancho Margot, and students working in their project groups. Pura Vida! These past two days we have been at the Tirimbina Field Station, which is part of the Tirimbina Ecological Reserve (http://www.tirimbina.org/). Daisy and Pablo were there to welcome us with lunch, after a canal boat ride out of Tortuguero and the bus ride to Tirimbina. The reserve is used for ecological research and tourism, all with the aim of promoting an awareness of the beauty and vital importance of the forest in this northern tropical region of Costa Rica. We began our first day with an unbelievable bird walk, where a myriad of species were seen. The afternoon was also breathtaking, with a walk across the largest suspension bridge in Central America (800 feet long), that spans the Sarapiqui River, where we saw toucans and a Howler monkey. Continuing on, we had a presentation on the history of chocolate. A separate post of those pics will follow. We finished the day off with a night walk, where we saw multiple species of frogs, a snake, cool insects and arachnids, and a two-toed sloth. Special thanks to Daisy and Pablo for hosting us, and to Mark and Raul who enabled students to see some really cool animals up close and personal! Yesterday we left Tirimbina to head to Rancho Margot, which is where we are today on Day 7 of our trip. See pics below from our time in Tirimbina, the iguanas at the Iguana Bridge, and a couple of pics before we headed into the Venado Caves. A full set of Venado Caves pics will be posted once we get access to an external CD player and can upload the pics from the CD we purchased. Pura Vida!